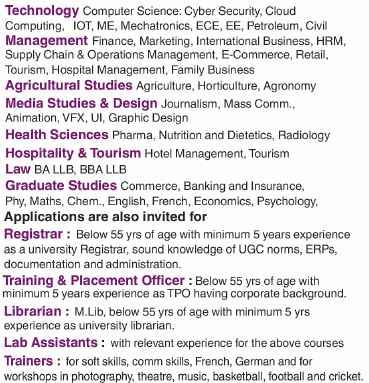 Quantum University, Roorkee has advertised for recruitment of Professor / Assistant Professor / Director / Dean Plus Non-Faculty jobs vacancies. Interested and eligible job aspirants are requested to apply within 10 days from 28th November 2018. Check out further more details below. About College: Quantum University is the world’s largest institution of higher learning to provide online degrees and certification programs in holistic, alternative, natural, and integrative medicine based on the science of quantum physics.Students can earn bachelor’s, master’s, doctorate and PhD degrees leading to professional board certifications. We are proud to be at the forefront of online learning technologies, including iPad Education, an innovative learning management platform, inspiring online video courses, and engaging teaching materials. 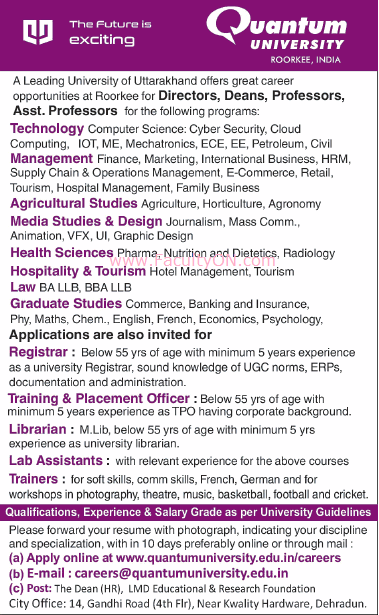 How to Apply: Interested and eligible candidates are requested to send their application along with CV, one set of copies of certificates, copy of PAN card, copy of Aadhaar card and recent PP size photo to the email address provided here. Clearly indicate your discipline and specialization in the subject line of email or apply online or apply by post.